Give TLC to kitchen cabinets. The kitchen is the heart of your home. Buyers also consider it the most important room. Giving it some TLC is a must, but full kitchen remodels come at a hefty price; however, painting those outdated oak cabinets and replacing handles/hardware is a fraction of the cost, and can help transform your space into looking more modern and clean. The DIY Network offers many easy-to-follow tutorials, including how to properly paint kitchen cabinets. 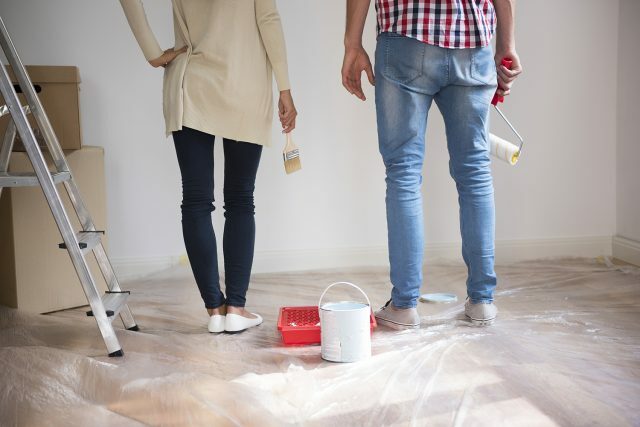 Paint costs as little as $25, and can make a big impact on the look and feel of your home. Walls become dirty, dull over time and attract permanent marks and stains, so it’s always good to add a fresh coat. Take a trip to your local home improvement store and pick your favorite shade of paint. Keep in mind that light neutral colors help even small rooms look larger and more spacious. Wait! Don’t go ripping out bathroom and floor tiles, yet. We’re talking small updates with BIG results. Replacing fixtures like sink faucets, light fixtures, towel racks and any hardware on the drawers or adding new caulking around the sink/bath are low cost investments with high rewards. Okay, so this isn’t such a simple task but in the end it will be SO worth it. If your wood floors are looking rough, consider refinishing instead of replacing. Refinishing hardwood floors is no easy task. Trust me when I say there is a reason why professionals charge thousands. When I purchased my home this was the first task I tackled and it took several days to complete, but I’m so happy I did it. If you’re up to the challenge, there are great step-by-step DIY videos. Your local home improvement store should have all the necessary tools to get the job done for reasonable rental prices. Don’t be afraid to ask questions. They saved me from making crucial mistakes. We’ve all seen it: the house with tons of potential, but it looks abandoned. Don’t let this happen to your home. There are tons of small projects you can do to give your exterior serious charm without forking over lots of ‘mula’. For instance, pick up a bright, bold can of paint for the front door; touch up the window frames and shutters with a more neutral color. Also, replacing old address numbers, outdoor light fixtures, mowing your lawn, adding fresh mulch to garden beds, or lining your deck or terrace with potted plants can give your house the face-lift it needs. Plant a tree to save some green. Did you know planting a tree won’t only give your home curb appeal, but can save you hundreds? It may not happen overnight, but having a tree can give you serious electricity savings by reducing air conditioning costs by as much as 35%. Consider planting trees on the east and west side of your home. This will shade your home from the hot summer sun, save some cash in the long-run and help ‘pretty up’ your front lawn.